Remote visual examinations and handling evolutions in high radiation field environments have required the use of radiation tolerant video systems. These systems involve significant expense and potentially require large envelope deployment structures. Recent events at Palo Verde including Upper Guide Structure damage and Reactor Vessel In-Service Inspections have provided opportunities for research, design and utilization of alternative approaches. Most significant of these, utilization of CCD modules with high magnification capabilities, have produced higher quality viewing, reduced maintenance expenditures, and rapid deployment intervals. Palo Verde Nuclear Generating Station (PVNGS) is a standardized, ABB-CE System 80, triple unit commercial nuclear power facility located 55 miles west of Phoenix, Arizona. It is operated by Arizona Public Service Company, which owns 29.1% of the plant. The other co-owners are Salt River Project, Southern California Edison, Public Service Company of New Mexico, El Paso Electric Co., Los Angeles Department of Water and Power, and the Southern California Public Power Authority. Palo Verde generates electricity to serve approximately four million people in four states. Each Unit produces approximately 1270 Mwe of power making Palo Verde one of the largest nuclear power sites in the United States. Unit 1 commercial operation began in January '86, Unit 2 in September '86 and Unit 3 in January '88. The main member of the System 80 reactor internals is the core support barrel assembly. This structure consists of the core support barrel, lower support structure and instrument nozzle assembly, core shroud assembly, barrel snubber lugs and alignment keys. With no fuel present, the core support barrel assembly weighs approximately 286,000 pounds and is configured as a right circular cylinder with a nominal inside diameter of 157 inches and a length of 32 feet. The core shroud within the core support barrel provides the transition between the cylindrical barrel and the rectilinear polygon core cross section. 241 fuel assemblies are supported and aligned by the core support structure at the fuel assembly lower end fitting with the core shroud providing a perimeter envelope. The Upper Guide Structure (UGS) is then installed within the core barrel to align and support the upper end of the fuel assemblies and prevent movement during pressure transients or severe accident conditions. The UGS also protects control element assemblies (CEAs) from the effects of coolant cross flow and provides CEA finger and extension shaft alignment during refueling as CEAs are removed from the reactor core with the UGS unlike most reactor designs. The lower section of the UGS assembly consists of a tube sheet plate and fuel alignment plate though which 964 guide tubes are rolled and welded in a pattern corresponding to the core arrangement. The guide tubes engage the fuel assembly upper end fitting outer guide posts and maintain alignment of the fuel assemblies with the UGS assembly to ensure free passage of the CEAs. In the spring of 1996, PVNGS Unit 2 commenced core offload during its 6th refueling outage. The first fuel assembly to be removed was found to be bound and unable to be dislodged from the core support plate. Further investigation as surrounding fuel assemblies were being removed revealed an adjacent assembly had been damaged by vertical load resulting in expansion of lower assembly grids and lower end fitting. Root cause of the fuel assembly damage was determined to be a deformed UGS guide tube, which unknowingly occurred during the previous outage. Repair of the damaged UGS guide tube was performed utilizing a specific use robotic manipulator deploying a variety of tube gauging probes and electronic discharge machining heads (Figure 1). The guide tube was remotely machined to original design tolerance. General area and detailed work progression underwater viewing was accomplished utilizing radiation tolerant underwater closed circuit television systems. Many manipulations of this equipment were required to obtain adequate viewing configurations which proved to be time consuming and of considerable effort. Equipment size and weight, and peripheral attachments including lighting and pan & tilt mechanisms with associated cable bundles made even simple manipulation difficult. 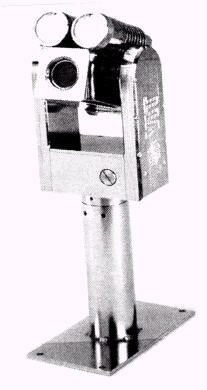 Dose rates at the UGS guide tube inspection camera locations were as much as 5000 R/hr leading to poor quality viewing. Close proximity of the UGS guide tube region to the camera also complicated positioning information. Duration of the guide tube inspection was approximately 18 hours. Generic implications of the root cause of this damage mandated visual examination of the UGS guide tubes at each of the other PVNGS Units during their successive refuelings to ensure no previous damage had occurred. Additionally, to ensure no new damage was created, video confirmation of proper UGS storage stand seating was required. These new requirements provided the catalyst to develop or obtain more suitable video capabilities. Visual Inspection Technologies, Inc. (VIT) provided a waterproof high-resolution color CCD camera with 24:1 zoom lens and integrated pan & tilt, Ca-Zoom (Figure 2). The unit is lightweight of 7.5 pounds and compact with an envelope of approximately 5 inches square by 9 inches. A small diameter single multiconductor cable assists in ease of deployment and manipulation. 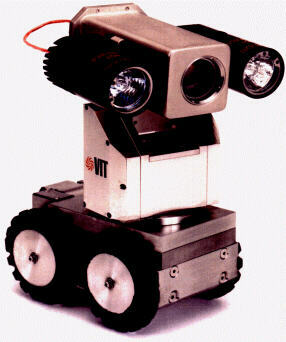 VIT also supplied a robotic crawler, ROVVER 4.0, with color CCD, pan-tilt-zoom camera system (Figure 3). This unit was also provided with a single multiconductor umbilical with a kevlar strength member allowing easy deployment and retrieval. The VIT equipment was utilized for subsequent UGS guide tube inspections configuring two Ca-Zoom systems at opposite corners of the inspection area for general area viewing and ROVVER to travel under and around the specific locations. The UGS was removed from the reactor vessel and lowered to approximately six feet above its storage stand. Held at this position, dose rates to ROVVER were approximately 50 mR/hr. The zoom capabilities of the camera allowed detailed examination at this distance with exceptional quality image and allowed large area viewing for position verification. Visual examination verified no damage to the guide tube land due to smear or impact, no raised metal chamfer damage, no encroachment of tube inside diameter, no outside diameter damage which may question future functional capability, and no discernible misalignment of guide tubes with respect to adjacent guide tubes. The general area viewing cameras aided in the manipulation of ROVVER and provided visual means for proper seating of the UGS. Total duration for the guide tube inspection was reduced to approximately 30 minutes. The Unit 2 seventh refueling outage required the first completion of the 10 year in-service inspection of the reactor vessel. To access the reactor vessel inside surfaces, the core barrel assembly had to be removed. Using historical time and distance information from upper guide structure movements, the following man-rem estimates were calculated for using similar technique for the core barrel movement. This technique utilizes local handling and viewing. Total dose estimates approaching 7 Rem were considered unacceptable and inconsistent with the Palo Verde ALARA program. Remote handling successes at other reactor sites prompted investigation of obtaining this capability at Palo Verde. The superior image quality and ease of handling identified during UGS inspections led to the establishment of a system of VIT Ca-Zoom cameras for core barrel removal and installation remote monitoring. The ISI Core Barrel Remote Monitoring System utilized 14 cameras, 7 being located underwater and 7 in air. Four air cameras were mounted to provide directional and general area obstruction viewing to the lift director. One camera was mounted on the polar crane trolley providing a direct overhead view and two additional cameras provided viewing of the hydraset load cell readout and laser elevation indicator. The overhead view was provided to the polar crane operator as well as the command station. Underwater cameras were strategically placed to provide viewing of all four alignment keys at the reactor vessel and the alignment guide pins above the vessel. At the core barrel storage stand, cameras were placed to allow viewing at all angles as the core barrel assembly was lowered into or removed from the stand. To provide assurance of video imaging, two radiation tolerant camera systems were positioned at the flange and storage stand. Video feeds from all cameras were supplied to a remote command station located on a lower elevation of Containment. Eight monitors were positioned to provide a representative orientation with the respective camera position relative to the core barrel. All cameras and command station equipment was in place and operationally checked prior to initial flooding of the refueling pool. During removal of the upper guide structure, personnel were stationed at the core barrel command station to verify views were adequate of the reactor vessel flange interface. Once the UGS was removed, a complete, realistic dry run of the core barrel removal was remotely performed. With no changes required, the core barrel removal evolution proceeded. Actual core barrel removal time, from loading the polar crane to unloading, was approximately 1.5 hours. Fourteen personnel were involved inside containment and received a cumulative exposure of 28 mR for the entire evolution. Core barrel reinstallation times and exposure were consistent totaling a cumulative 32 mR.
Expediency and remote handling capability was directly attributable to the exceptional image quality and viewing configuration of the underwater VIT cameras. Time savings for the evolution was estimated at four hours. Exposure reduction through utilization of remote capabilities was greater than 6 man-Rem. Exceptional image quality resulting from use of these type camera systems has provided motivation for other uses. Palo Verde requires visual verification of proper core support plate seating during fuel assembly loading into the reactor vessel. This has been historically accomplished utilizing a radiation tolerant system with pan, tilt and lighting peripherals installed on the core support plate. Picture quality would be initially adequate however degraded rapidly as fuel was loaded approaching the system. The large operating envelope also necessitated withdrawal of the system with a significant number of fuel assemblies remaining to be loaded. This system was replaced with a VIT Ca-Zoom camera and in-house fabricated mount located on the upper flange of the core shroud. Removal of the camera from the radiation field produced by the fuel and core shroud allowed utilization throughout the entire reload with very little image degradation. The VIT Ca-Zoom camera systems have been utilized successfully for irradiated fuel examinations, CEA alignment verification, foreign material identification, reactor pump bowl in-service inspection, and general area underwater monitoring. Fabrication of various mounting and deployment mechanisms has provided ease of applicability. Miniaturization and technological improvements in underwater capacity CCD based camera systems have provided a small envelope, light weight, easily handled alternative to radiation tolerant tube type systems. Utilization of the VIT Ca-Zoom cameras and ROVVER 4.0 crawler enabled expedient successful completion of UGS guide tube inspections and core barrel assembly handling at Palo Verde. Resulting timesavings for the two evolutions resulting from use of these systems were approximately 22 hours and cumulative exposure savings greater than 6 man-Rem. Combined with various in-house mounting and deployment mechanisms, the CCD based systems have become the workhorse of Palo Verde underwater video capabilities.